Perhaps, one day, the Centre for Advanced Robotics at the University of Moratuwa might devise a robot capable of lighting an oil lamp. But thankfully it was the human touch that was displayed as the traditional opening ceremony for an interactive discussion on Future Directions of Advanced Robotics in Sri Lanka got underway at the Institute of Engineers Sri Lanka premises last Thursday (April 4). 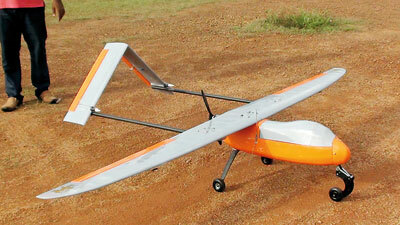 File picture of a drone developed by Moratuwa University. Soon after lighting the oil lamp, Dr. Buddhika Jayasekara, Director Centre for Advanced Robotics (CAR) at the University of Moratuwa, outlined the vision of this body established just two years ago: To become a centre of excellence in advanced robotics in South Asia. “Our mission is to foster and enhance research and innovations in advanced robotics through collaborative partnership within our own university as well as local and international research institutes, universities and industry for uplifting living standards. Our focus will be mainly on how to serve the country,” Dr. Jayasekera outlined. CAR is one of eight centres set up in recent years at the University of Moratuwa. Others include data science, language – similar to what reputed overseas universities like Cambridge are doing. The initiative is to create an image for the University of Moratuwa, as the place to go to for anything robotics (in the case of CAR), making it easier for the marketplace to not only invest in projects but also creating a gateway for industries to easily tap into the technical skills and talent available. The founding members of CAR, apart from Director Dr. Jayasekara, are: Prof. Rohan Munasinghe, Prof. Ruwan Gopura, Prof. Sisil Kumarawadu, Dr. Thilina Lalitharatne, Dr. Damith Chaturanga, Dr. Sulochana Sooriyaarachchi, Dr. Sanath Jayawardana, Dr. Peshala Jayasekera, Dr. Chandima Pathiranage, Dr. Udayanga Hemapala, Dr. Jayathu Samarawickrama, Dr. Palitha Dasanayake, Dr. Harsha Abeykoon and Dr. Ranga Abeysooriya. “Robotics is one of the driving technologies of the world where many countries have already started using it in local industries speeding up their development process. In Sri Lanka this technology is still in the developing stage. The multi-disciplinary nature and flexibility in shaping up to the task make robotics the means for a solution in almost any field,” Dr. Jayasekara revealed in his opening address. “For Sri Lanka, robotics can make a very significant development if it is properly developed and deployed,” he added. Apart from collaborating with other bodies, the roles of CAR include conduct research and facilitate postgraduate degrees; create opportunities for innovations, product development and commercialisation of robotic solutions; and provide solutions to local and international problems. Presentations on four different aspects of robotics – industrial, aerial, field and assistive – followed Dr. Jayasekara’s introductory speech. The common theme among all the speakers was how to reduce the costs of robots on the market to such a level that even a small organisation can afford to have a robot system. When that happens, then probably we will have a robot lighting the oil lamp.